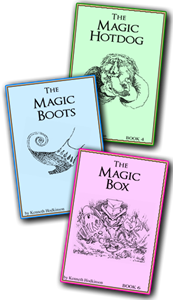 The Magic Stories, books for 2nd & 3rd grade levels. "HAVE YOU EVER WONDERED HOW WELL YOUR CHILD IS READING? 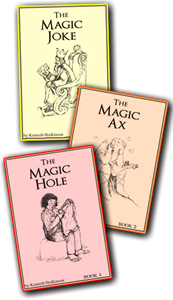 With the full set of book from The Magic Stories, not only do I have six printable little books with a well-crafted tale, moral teaching (think Aesop’s Fables), and adventure, but there are fun and easy to use assessing tools as well. Amber Smith at 200 Fingers & Toes. "These are excellent stories for emerging readers and parents will appreciate the good moral teaching which accompanies the tales." "You could do one book and set of worksheets a month and get 6 months of reading practice out of this downloadable program." "I love how The Magic Stories make reading a fun activity rather than just a list of reading comprehension questions. I tend to steer away from mystical magic or "naughty" things in my homeschool, so I first reviewed the stories before handing them over to my daughter. What I discovered is that the stories are some, or similar to some, I remember from childhood using magic only as a way to express the moral of the story. I found that the "Naughty" words are used to pique your child's interest, as the Naughty 40 are simply words children tend to struggle with - not bad words as you may think when you first see the term." "This thoughtfully designed reading program is intended as a follow-up to completed phonics instruction, geared towards grades 2-3, although I feel all elementary students will enjoy these stories and greatly benefit from the activities included." "Often times worksheets are just busy work but these worksheets had solid content." "When I first heard about Magic Stories I was concerned with that word “magic” in the title. Like many Christian parents, that word can be harmless, or could indicate something to be concerned about (yes, we’re one of those families that avoid that certain book and movie series that many love). 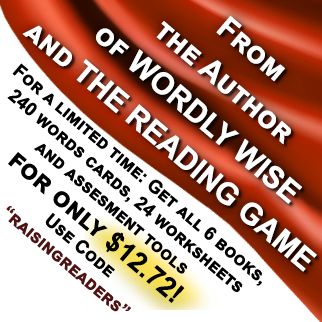 When I learned this new supplemental program for new readers is from Allsaid & Dunn, LLC, the people that brought us The Reading Game (which we loved) and the authors of Wordly Wise, my fears were lessened. When we actually received our files for the stories and I read them, those initial fears were completely eliminated. These are wonderful stories!" "Leveled readers always make me crazy because they are full of words that are NOT readable for the level my kid is in. The Magic Stories ends that frustrating loop. They give you the list of difficult words first. You can introduce and play with the words for a while before you get to the reading." The stories are written well, and are a great complement to your regular reading instruction. The "magic" in the stories isn't the kind you think. These stories are filled with moral characters, and wholesome stories." "These tales are simply delightful and reminiscent of classic children's literature in both their style and content. I appreciated the more complex sentence structure that is often missing from modern emerging reader books." "I was impressed with the organized, research-based approach found in The Magic Books Series. I love the simple assessments that allow me to rate and track my student’s progress in the different areas of literacy — particularly their fluency. It’s inexpensive, easy to follow, highly engaging (my kids love flash cards), and takes little prep time. I highly recommend it." "I personally really liked the easy way I could turn the vocabulary (Naughty 40 word list) into games that we could play. I printed out double set of the cards for us to play memory. This game allowed her to recognize these harder words by sight, but also helped to reinforce their actual meaning." "I am really impressed with the magic stories ...I love that (my daughter) was given two different scenarios to finish her own story in her own words (in the creative writing exercise). I love the fact that she got creative when she wrote by turning it into a story herself. Honestly, I think this is my absolute favorite part of this whole supplemental program. I haven't been able to find anything to inspire her like this before we started using this." "Mister Man laughed out loud reading each one of The Magic Stories. And when any time elapsed between opportunity to read the next book in the series, he would ask repeatedly, "When can I read a magic story again? Where is my binder? Can I read without you right now?" "An excellent supplement for transitional readers who need practice with fluency and comprehension, especially those who enjoy worksheets and extra activities to go with their stories." "I am loving The Magic Stories for two reasons: first, the list of The Naughty 40 (words) to prep before the story and secondly, the squeal of delight when I gave my daughter her own book to color and read for herself." "If you are looking for a supplemental reading program designed to build confidence in reading and develop strong comprehension and writing skills while having fun, then Magic Stories are for you and your family!" . "At this age level, appearance is everything. It plays a huge role in the readers initial mindset of whether or not they want to even begin the story. I felt the creators of “The Magic Stories” did an excellent job in this regard. The text was on the larger side and there was quite a bit of space between each line. Margins as well were quite generous, and there were sufficient images. It helped give the impression of not being too difficult or overwhelming." "The quality of the stories is really quite good and I was pleased. Too often stories for reading comprehension feel contrived and are not pleasant to read. These are enjoyable, fun, and brought good thoughts and ideas, as well as creative writing, to our days." "Each of the six stories is charming and funny." "I have been a rock star fan of Wordly Wise (the authors of The Magic Stories) ever since my 1st year homeschooling." " This supplemental reading program consists of six fanciful stories written in an old-fashioned style. Each story is written in elegant prose peppered with a more classic vocabulary. " "My daughter adored these stories." Read Melissa's entire review at Grace-Filled Homeschool. "I believe these stories were a good fit for our guy. The stories were engaging and kept his attention. The worksheets provided a great opportunity for me to see if he was paying attention while reading or just going through the motions." "The Magic Stories is a supplemental reading program designed for 2nd and 3rd grade students but appropriate for any student who needs to work on reading comprehension." "I was not familiar with, nor had I used The Reading Game (though, after looking it over, I wish I had known about it when my children were learning to read). But, I had no trouble picking up with The Magic Stories without ever using The Reading Game. The two are separate and can easily be used individually." "I would recommend these to those who like fun stories and are 2nd - 3rd grade reading level...although I enjoyed them as well. I believe that those grades would benefit most from the complete package. These are a great supplemental reading program for homeschool setting." "This is good for those who have a good imagination and enjoy creative writing. It’s something a little different from the usual curriculum, which makes a nice diversion. Because it’s small, it is also easy to take with you on the go. It’s optimized for reading on an iPad so you can read it from there and then just print the question sheets, thus also saving on printing costs." "Any child in the elementary years can use these 6 beautifully written stories along with four thought provoking, creative writing, and cognition building exercises to complement them." Laura at Day by Day in Our World. Read the entire review! "This is a wealth of reading readiness at your fingertips. Reluctant readers are going to thoroughly enjoy reading and studying through these magic stories and worksheets just as much as children who simple enjoy reading for reading's sake." "The stories as a whole remind me of some of the fairy tales I read as a child, and the fact that they have specific words woven through them so seamlessly is pretty impressive. If you appreciate the qualities of fairy tales, you might want to give the Magic Stories a try with your intermediate/reluctant/struggling reader." "This set of 6 books is designed to be used with 2nd and 3rd grade students who have finished a solid reading program, but could still use some practice with their reading, comprehension, vocabulary, and overall confidence in language arts. There’s also a section to test reading fluency for each book. There’s a page that has a 100-page excerpt from the story and a place for you to write their name, date, and accuracy. This would be a great diagnostic tool, particularly if you had a struggling reader at the beginning of the year. Try them again with the same test a few weeks or months later to ensure that they’re improving their reading fluency skills!" Read the review: Jenn at Real and Quirky. "I totally recommend The Magic Stories to homeschooling families everywhere." "Allsaid & Dunn, LLC has come up with a fun and entertaining way to not only improve reading skills, but also promote values." "My son was really intrigued with these stories. He would sit and read each story through cover to cover in one sitting. The benefit of these for my son was great." "The stories are really varied - you have fairy tale inspired stories, fable style stories, stories from other cultures, silly stories, and stories intended to teach a moral." "I love how the worksheets help with reading comprehension and with creative writing in really interesting ways." "My boy enjoyed The Magic Stories and laughed at many parts. He told me, "The Magic Hotdog is my favorite, because it's so funny." "For the amount of content and exercises you receive, $16.95 is a great price!" "Supplemental materials that offer learning opportunities in an engaging manner, like The Magic Stories can be a huge blessing to those teaching early reading, or helping those who struggle with reading." Lis at Acorns of Gold. "Not only are The Magic Stories great little readers, they offer corresponding worksheets that make them a comprehensive reading curriculum, as well." "More figuratively, Magic Stories aim to make literacy skills "magically" unfold in children by engaging them in stories and activities that help them practice pre-existing phonemic awareness and phonics, while developing fluency, vocabulary, and comprehension skills." "I liked that the stories all had good moral lessons in them. Any fun activity that also bolsters character building is a win-win in my book!" "My son loves how vivid the stories are – his imagination has never been better – he has a great sense of humor too so he really enjoyed how often these made him chuckle. Combine great stories with worksheets that require you to be creative and at the same time, focused on those details within the story, I say that makes this a real winner!" "Each story is a fantastic tale that has a moral lesson." "This program is so much fun!" "I love, love the assessments can come included. You can see that this assessment has a spot for "pre" reading the book and "post" reading. You will also notice the criteria. The student needs to recognize the word, be able to read it in a sentence and understand its meaning. I like that! Many programs stop at "recognizing the word." It also gives you a goal. If your student has difficulty with a word or two you could use tack the offending word up all around the house." "My husband and I have been quite impressed with her reading skills as she reads through these books. We were wondering if she was really reading some of the chapter books she said she was reading or if she was just skimming along, not understanding. Realizing all these "naughty" words that she actually recognizes and understands has been a big shock to us." "We found ways to make reading fun and stress-free, knowing that the more enjoyable it was, the more interested she would be. We learned to add just a touch of "magic" to the learning process, and were simply ecstatic when letters started to form words and words started to form sentences in her mind's eye." Lynn at This Day Has Great Potential. Read the review! "If your child has ever tried to read through some “leveled readers” and discovered half of the words in the reader are above their reading level than this program will solve this issue for you." "(T)his program is another winner. It might be just the ticket to helping your emergent reader find success." Crystal H at Living Abundantly -->Read the review! "I think this is a fantastic product. I think it is reasonably priced and something you can even use to review time and time again." "These stories are very well written and are very imaginative while teaching a moral." "These stories are so awesome! We loved to read them aloud, which meant the little girls and big brother were all able to listen to them. The stories were a great discussion starter for us as a family." "Practically speaking, with this being a PDF download, there's no waiting for the product to arrive. Set it up on your device, or print them out. So easy and convenient! I'm keeping this in mind to recommend to my friends and family with early elementary students." "The tales are fun, imaginative, and varied." 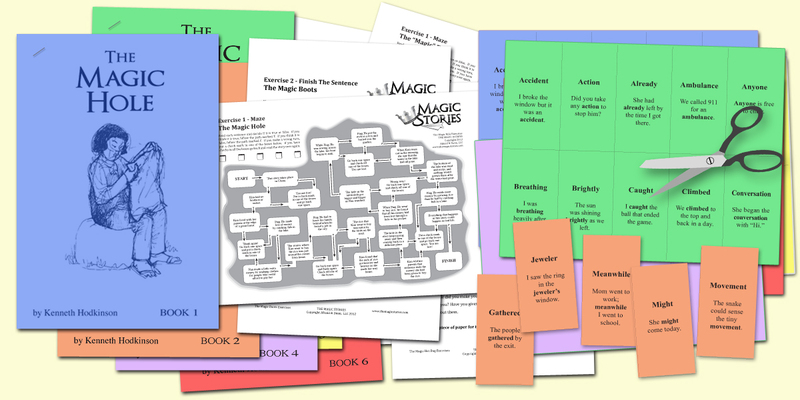 "Not only are The Magic Stories great little readers, they offer corresponding worksheets that make them a comprehensive reading curriculum, as well. " Jen at Real and Quirky. Read the Full Review here. Read the full review at This Day Has Great Potential. "I love how The Magic Stories make reading a fun activity rather than just a list of reading comprehension questions. I was not familiar with, nor had I used the Reading Game (though, after looking it over, I wish I had known about it when my children were learning to read). But, I had no trouble picking up with The Magic Stories without ever using the Reading Game. The two are separate and can easily be used individually." "The stories are really varied - you have fairy tale inspired stories, fable style stories, stories from other cultures, silly stories, and stories intended to teach a moral." Meredith at From Meredith to Mommy BlogSpot." Jennifer M. at Dear Homeschooler. Read the review here. Hillary at Walking Fruitfully. Read the review here. Elyse at Oiralinde. Click here to read her full review. "This program is so much fun!